"He was not of an age but for all time." This is a thread where you can post Shakespeare-related stamps. Pictures of Shakespeare, scenes from his plays, actors who played in Shakespeare plays, etc etc. 1964 was the 400th anniversary of Shakespeare's birth. Here is a Falkland Islands stamp for the occasion, SG 214. In the background is the Royal Shakespeare Theatre at Stratford-on-Avon. Great Britain issued a set of five stamps in 1964 to mark the 400th anniversary of Shakespeare's birth, SG 646-650. Here is the lowest value, showing Puck and Bottom from A Midsummer Night's Dream. Here is the 6d value from the 1964 GB set, showing Feste, the clown in Twelfth Night. The 1s 3d value from the 1964 GB Shakespeare set shows the famous balcony scene from Romeo and Juliet. The 1s 6d value from the 1964 GB Shakespeare set shows Henry V praying on the evening before the battle of Agincourt. The final stamp from the GB 1964 Shakespeare set shows Hamlet studying the skull of Yorick ("Alas, poor Yorick"). 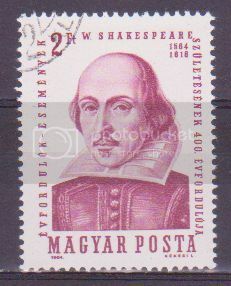 A Hungarian stamp issued in 1964 for the 400th anniversary of Shakespeare's birth.